Python hunter Jason Leon set a record for the South Florida Water Management Department's Python Elimination Program with this 17-foot-1-inch Burmese python that he brought to the District's Homestead Field Station, Dec. 4, 2017. A record-breaking 17-foot Burmese python was captured in the Florida Everglades on Friday. 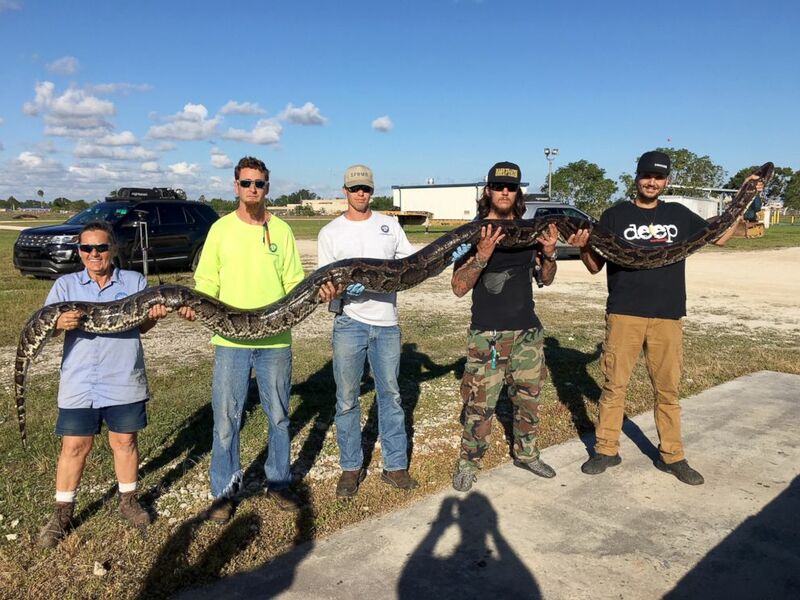 Weighing in at a monstrous 133 pounds, it is the largest python captured to date through the South Florida Water Management Department (SFWMD) python elimination program, which aims to reduce the large population of pythons in the Everglades. Pythons are a problem in the area because they prey on native wildlife, according to an official SFWMD statement. “In areas of heavy python population, there is a 99 percent reduction in fur-bearing animals,” said SFWMD Python Elimination Program Manager Mike Kirkland. In March of this year, SFWMD hired 25 experienced hunters to fix the invasive predator issue in Miami-Dade County. “In total, the hunters have removed 743 pythons. If they were laid out end to end, it would equal over 5,000 feet and weigh over 11,000 pounds,” said Kirkland. Python hunters are paid minimum wage up to eight hours a day to look for pythons. The bounty for captured pythons is $50 for the first 4 feet and $25 per foot beyond that. Kirkland told ABC News that after the pythons are captured, they are euthanized and then brought to the SFWMD facility for an official measurement. “Usually, the hunters will then take the snakes and make products with their skin. The snakes are not considered a food source because they contain high levels of mercury,” Kirkland said. According to Kirkland, there have not been any recent reported injuries from wild pythons, but there have been tragic accidents with pet pythons. Kirkland says that there have not been any issues with animal rights groups. "We follow the American Veterinary Medical Association guidelines for euthanasia," Kirkland said. "The public realizes that unfortunately [the pythons] are just in the wrong place."